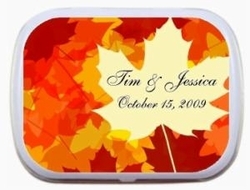 Beautiful fall colors - splashes of orange, yellow and reds - this fall themed, personalized mint tin is a perfect party favor for weddings, showers, anniversaries and more. Personalize each tin with 2 lines of text and your choice of tin color. Also, choose the candy of your choice.